This former member of WVSAE is now a new member of the West Virginia Supreme Court of Appeals. Join us June 11 at the Marriott Town Center Hotel, when Justice Evan Jenkins shares his journey from being “one of us,” to being a member of the West Virginia Legislature, the U.S. House of Representatives and now the Supreme Court. Not only will he discuss the journey, but Justice Jenkins will discuss ethics and the changes being enacted under the “new” Court. It has been well over a decade since a Justice of the Supreme Court of Appeals met with us, so take advantage of this opportunity! Reservations are due by Friday, June 7, and can be made by clicking here. The board of directors will meet at 11:00 a.m.
Justice Evan H. Jenkins was appointed to the Supreme Court of Appeals of West Virginia by Governor Jim Justice on August 25, 2018, and took the oath of office on October 1. He was elected later in 2018 to complete the unexpired term of retired Justice Robin Jean Davis, ending on December 31, 2024. 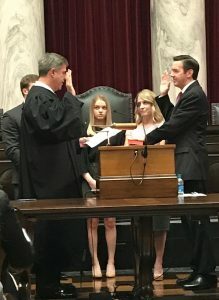 At the time of his appointment to the bench, Jenkins was a member of the United States House of Representatives, to which he was elected in 2014 and re-elected in 2016, representing West Virginia’s Third Congressional District. He previously served three terms in the West Virginia House of Delegates, beginning in 1994, representing Cabell and Wayne counties, followed by three terms in the West Virginia Senate, from 2003 to 2015. Before his election to Congress, he was executive director of the West Virginia State Medical Association, general counsel of the West Virginia Chamber of Commerce, and taught business law at Marshall University. Jenkins was admitted to the practice of law in West Virginia thirty years ago and began his legal career as an associate attorney with the Huntington law firm of Jenkins Fenstermaker, PLLC in 1988. A native of Huntington, he has a bachelor’s degree in business administration from the University of Florida and a law degree from the Cumberland School of Law at Samford University. Jenkins and his wife, Elizabeth, live in Huntington where they raised two sons and a daughter. He is active in the community as a member of the First Presbyterian Church and has served as a volunteer leader for the American Red Cross, Boy Scouts of America, Big Brothers Big Sisters of the Tri-State Area, Foundation for the Tri-State Community, Foster Foundation, and Lily’s Place, a nationally recognized facility that cares for newborn infants suffering from drug exposure during pregnancy. Use the form below to register by Friday, June 7. Special needs we should address?